You said : « The direction on the wind indicator looks like the wind is coming from the ease » ....You probably mean « from the East ». Here is an example of a wind blowing from the East. It is shown by the picker as an East wind or blowing from 90° direction. If you have different indications, please post a screenshot. He considers the entire greyflag picker as a wind vector... ??? You have to read what's inside the picker. For exemple on the pictures above : Wind is blowing FROM the east (E / 90° from north) and windspeed is 36 knots. Can you see this info in the picker, or it is empty ? If it's empy, it doesn't work properly. Personally I don’t like this table from Esri ! It’s absolutely confusing. Better to forget it. They are not a meteorology organisation, just a private company selling all kind of maps and mapping software. 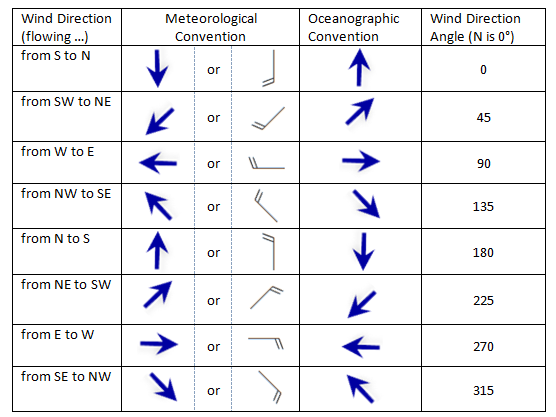 Meteorologists will confirm that the symbol on a map of a wind blowing from a direction is NEVER an arrow pointing in that direction (for a south wind blowing from south, we must use an arrow pointing to the north). This has been already hardly discussed on this forum. However this is different when you build wind rose to show the wind direction frequency at a location.